I have never heard of these before. It’s great that options like this exist to help families and individuals who live in areas that are prone to tornadoes feel like they are at the mercy of the elements. My wife grew up in Monson, MA and they were hit hard by tornadoes in early summer. I hadn’t heard of this before, either. But then, I live in an area where we are more likely to carry shovels and ashes in our car trunks in the winter! 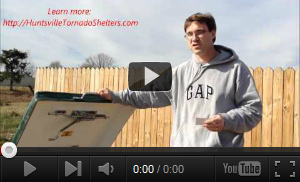 What a great thing a safe room is, to those living in tornado areas. It could mean lots less lives lost, if people had this. Very true! It’s amazing how many people in tornado-prone regions do not have any real type of adequate protection from severe weather like tornadoes. Last year’s storms though have helped to show the importance of proper planning and having proper shelter so we can hopefully save more lives from such severe storms. Do your all weather steel safe rooms come with a FEMA F-5 certificate? Hey Sue, yes all of our tornado safe rooms and storm shelters have been tested at the Texas Tech University Wind Science and Engineering Center which is the basis used for determining the FEMA standards of being able to withstand an EF-5 tornado. We have tornadoes up here in Illinois. Just a couple weeks ago, one person died in a tornado that hit… and then a few weeks before, a bad one hit a little south from where I live. This season seems to be a real hot one. Hey Nile, yes it’s not been a good year for tornadoes already. They can hit anywhere, anytime which makes them quite dangerous. That’s why we offer our FREE [email protected] service to people on the webpage so they can be aware and alerted when dangerous severe weather rolls in!